1 Heat 1 tablespoon Hellmann's® or Best Foods® Real Mayonnaise in large nonstick skillet over medium-high heat. Add mushrooms, onion and garlic and cook, stirring occasionally, until mushrooms are golden and onions are tender, about 15 minutes. Stir in vinegar, broth, thyme and remaining Mayonnaise; heat through. 2 Remove mushroom and onion mixture; set aside. In same skillet, over medium-high heat, brown steak on both sides and cook until desired doneness. 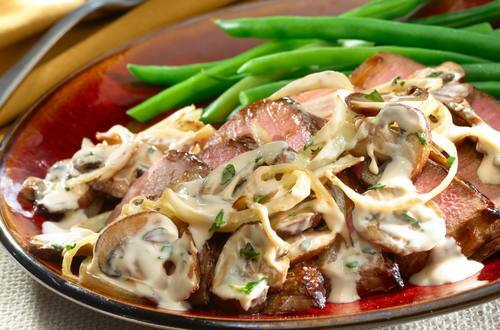 Top steak with mushroom and onion mixture and serve.